Italians totally have the most fun words for things. In English, we say shrimp. It's such an unpleasant word - on the one hand, you have this freakish looking sea creature that comes in all different sizes (from cocktail to jumbo). On the other hand, the human application conjures up images of short and stout people. Not a fun word at all. If you are trying to be posh, or have delusions of grandeur, you could always call them prawns.....but then everyone would just look at you like you were some kind of nut bar. Anyway, I had a rather annoying day today (I seriously don't think I've ever been that annoyed before... and it was about the most ridiculous, tiny stupid little thing). I sense a lightbulb joke coming on.....gah. Anyway. My annoyance stewed all afternoon, to the point where I knew that comfort food was most definitely in order tonight. I did a little brainstorming about my fridge/pantry contents and decided that pasta would definitely be the thing. There is nothing quite so delightful as the perfect al dente pasta....the firmness of good pasta is one of my favourite things to eat. I find it very very frustrating to go out and eat pasta, because so many "restaurants" (yes, I'm talking to you East Side's) overcook it to the point of pointlessness and utter loss of texture. Yuck. Anyway, I had to make a couple of quick stops on my way home (hungry bunnies and all that), and while I was at Bulk Barn (cheapest place for hay - who'da thunk?!? ), I decided to treat myself to something new. But on to dinner. WIth pasta, I decided that I wanted shrimp, and then it occured to me that we also had some bacon......and a plan started to form. The end result was absolutely delicious, though if I had more ingredients in my fridge, I would probably make sure to use things like fresh basil, and perhaps some green veggies for colour. But for an impromptu random dinner, this was pretty darn good. 1. Fill a large pot with hot tap water and bring to a boil over medium-high heat. 2. Meanwhile, heat bacon in a large skillet on medium heat. After a couple of minutes (once bacon starts to sizzle), add shallots and garlic. 3. Add red pepper and cook until softened, about 3-4 minutes. 4. 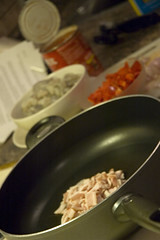 Add drained diced tomatoes and italian seasoning, cook for a few more minutes. (at this point, your water is probably boiling - cook pasta according to package directions for al dente). 5. Add white wine, and chicken broth and bring to a boil. 6. 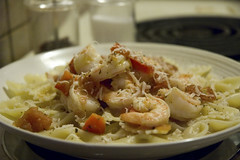 Add shrimp and cook until shrimp is pink and opaque. Serve sauce over drained hot pasta. Sauce is quite liquidy, so I recommend serving with a nice crusty bread to soak it up! Top with fresh grated parmesan (do not, I repeat, do NOT violate your food with canned Kraft stuff.....) and salt and pepper to taste. What did you end up doing with the vanilla? 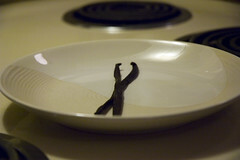 Real vanilla smells devine..dont you think! There is nothing else like it. In my opinion its worth every penny. It does not compare to the little bottle of dark liquid most of us have in our kitchens that is full of alcohol and so little vanilla. JMO! I haven't done anything with the vanilla yet! I'm quite excited though.....I need to make some sort of recipe that really showcases the vanilla flavour. I think I might use one for something sweet (like some sort of vanilla custard tart maybe) and one for something savoury (like a vanilla bourbon chicken of some sort).....and last, I plan on making my own vanilla sugar, but placing the empty pod in a jar of sugar. So excited!!!!!! AandJ - you'd be super jealous of my yummy lunch today - I have small containers of each pasta I've made recently - one of spinach walnut canneloni and one of the shrimp pasta!